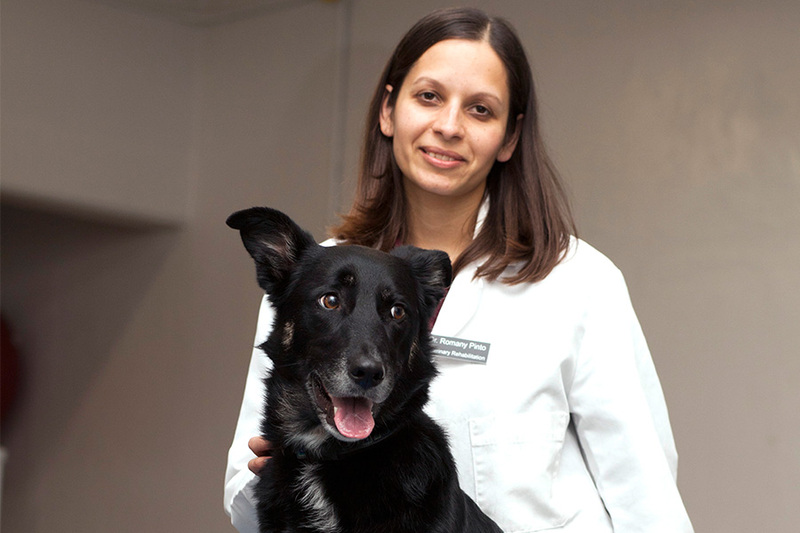 Dr. Romany Pinto runs the VMC rehabilitation clinic. In the basement of the Small Animal Clinic in the Western College of Veterinary Medicine (WCVM), Dr. Romany Pinto is working with Kaibo, a brown toy poodle with hip and knee problems. Pinto and her assistant repeatedly move Kaibo—who visits the Veterinary Medical Centre rehabilitation clinic twice a week—through the motion of sitting and lying down on a foam pool noodle, and then up again. "Where do you start with Kaibo?" said Pinto. "He has a few problems, but he's a rehab star." Once Kaibo finishes stepping up a set of stairs a dozen or so times and balancing on a physio ball, the assistant leads Kaibo to the underwater treadmill for the final part of the day's session. These types of rehabilitation sessions for small animals have been offered by the WCVM for about seven years now, explained Pinto, a clinical associate who runs the program. Kaibo on the underwater treadmill. "The treadmill was donated by a client, and that's what actually got the rehabilitation program started," she said, adding that particular piece of equipment—a treadmill encased in a tank of water to take some weight and pressure off of the animals joints while walking—is every visitor's favourite. Since the arrival of the treadmill, the range of rehab equipment has grown to include a therapeutic laser to speed tissue healing, a therapeutic ultrasound for deep heating, electro-acupuncture and electrical-stimulation to stimulate muscles, a special walkway to measure differences in the pressure an animal places on each limb while walking, and wobble boards to improve balance and core strength. Pinto and her staff treat pets with a wide range of conditions, but her most common patients are those recovering from surgery, have neurological problems, have arthritis or mobility issues, are canine athletes with soft tissue injuries, or are in need of a weight-loss program. 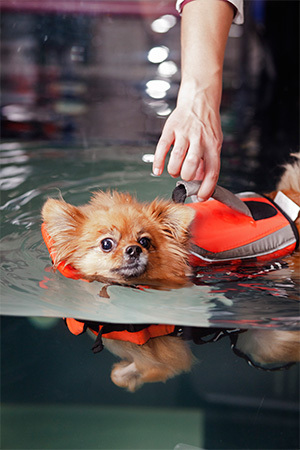 "We treat seven or eight animals a day, mostly dogs and cats. I had one rat," said Pinto who describes herself as a dog and cat person equally. "Dogs want to please, but cats generally don't, so you need to find out what motivates them (to do the exercises)." Some of the more challenging cases, she continued, included "re-conditioning an out-of-town police dog in the middle of winter and finding ways for an owner in a wheelchair to help their pet do the needed home exercises." Pinto also does animal acupuncture for neurological issues and pain management, a field that started gaining popularity about 10 years ago. "I've done acupuncture on hamsters, rabbits, rats and a lizard," she said. But no matter the animal size, condition and treatment method, Pinto's goal remains the same: to get the patient back to as close to normal as possible. And working with the animals through the process gives Pinto, and the pet owners, an incredible sense of happiness. "I get to know the patients and their owners. Even patients that are nervous initially usually like coming here eventually. It's a very positive place since we usually get to help improve an animal's condition."